To follow Jia Zhangke’s career closely is to witness a great, restless artist wriggle out of a number of our film culture’s pigeonholes. Despite his reputation as a master in the school of austerity—that art-house mode which has encouraged artistic complacency and political indifference in several of his peers—Jia’s aesthetics remain under construction and open to the full range of cinematic possibilities. At a time when the other leading figures of Chinese-language cinema, including Wong Kar-wai and Tsai Ming-liang, seem fully committed to (or, in a few cases, trapped by) the styles and themes that made them famous, with each new film Jia is adding new tools to his art in order to renegotiate his relationship to realism, and to make the quest for personal and national truth ever-renewing rather than predictable and monolithic. His latest, 24 City, is a blend of documentary and fiction that omits some of the main tropes we associate with those genres, aspiring to neither vérité nor conventional plotting. 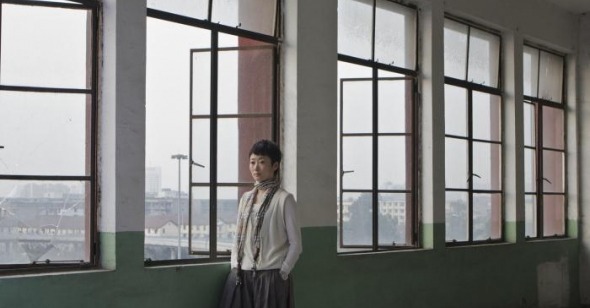 Performed by both nonprofessionals and established actors, the film gathers stories across three generations of workers connected to a state-owned factory in Chengdu, now being converted into a luxury apartment complex. Their revelations range from devastating memories of long-lost family members to bittersweet recollections of puppy love, and the common struggle of all the interviewees seems to be (as one woman puts it) to “smile through one’s tears,” at least on camera—an attitude that lends the film its schizophrenic sense of boundless hope and suppressed tragedy. But what begins as a straightforward oral-history project results in a rocky marriage between seemingly irreconcilable impulses, and a disorienting provocation on the sacredness of truth in the documentary form. In response to the high-pitched melodramas of Zhang Yimou and Chen Kaige, Jia began his career in the late nineties in pursuit of the real, recreating the crawl of moment-to-moment experience in the manner of Bresson, Ozu, and Hou. To those who admired his earlier work, it may seem that he has allowed too many postmodern flourishes to corrupt his unobtrusive, observational tone. This shift begins most obviously on the surface, immediately discernible in his changing visual style. Jia’s “hometown trilogy,” set in his native Shanxi (Xiao Wu, Platform, Unknown Pleasures), may have had its subtle, meta methods of referencing the theatrical in its settings—in Platform, for instance, the ancient wall of Pingyao becomes a stage on which young love is rehearsed and dramatized—but those films also had a documentary-like commitment to accurately capturing the dirt and desolation of small-town China. Recently the work of Jia’s masterful cinematographer, Yu Lik-wai, has acquired a glossy sheen capable of erasing the pollution in Beijing (The World) and aestheticizing the ruins of the Three Gorges region (Still Life and its short-doc counterpart, Dong). 24 City follows in the vein of Still Life’s sharply defined lines and hypnotic jade-green, azure-blue color scheme, and also maintains the revisions that film made on Jia’s long-shot, long-take approach. In several scenes, particularly in a series of establishing shots that have interview subjects posing for the camera, Jia’s mise-en-scène mimics the deliberateness of still photography, with a heavy reliance on close-ups and medium shots, and a greater sensitivity to poetic images—such as a butterfly’s wings flapping against a window, or rain bouncing on broken panes of glass. Unlike the Shanxi films, in which the director’s eye is set adrift in time and space along with his characters, 24 City is confident of what it’s seeing and where it’s going, held in the tight grip of a fiercely intelligent, aesthetically self-conscious auteur. Despite its formal restraint, 24 City ends up being Jia’s most emotionally visceral film. In the past, Jia’s work has often owed its emotional remoteness to his focus on hopelessly inarticulate men—from Wang Hongwei’s deadbeat protagonist in Xiao Wu to Han Sanming’s near-silent miner in Still Life—which reverses the trend of emotive female performance (as exemplified by such icons as Ruan Lingyu and Gong Li) and moral melodrama that has been a defining characteristic of mainland Chinese cinema since its inception. It’s no coincidence, then, that this more directly affecting work is also his most woman-centered to date, a perhaps inadvertent reaffirmation of female sorrow as the most convenient signifier of China’s social upheaval. Jia pulls off his invocation of an old-fashioned (often exploitative) melodramatic trope by calling it out as a filmmaker’s tool, situating cinema’s appropriation of female emotion in the same fantastical space as the animated interludes in The World and the UFO sighting in Still Life. The fictional interviews make us aware not only of the ambiguous line between genuine and performed emotional expression but also of the central role gender performance plays in the affective qualities of melodrama. As if tipping his hat to Stanley Kwan, Hong Kong’s chief auteur of women’s pictures, Jia partakes of the genre-blurring pioneered in the 1992 masterpiece Actress, in which a movie-star biopic is couched within a documentary about the film’s production. Kwan reveled in the cathartic capacities of feminine expressiveness, but he also recognized that quality as a fictive construction, and dissected it as a subject with potentially harmful effects on the realities of women’s lives. 24 City’s meta-cinema is not nearly as straightforward, but by blending interviews of real laborers with the performances of instantly recognizable (and mostly female) professional actors, Jia achieves what may be his most head-spinning trick yet, a study of how emotion can be genuine and performative at the same time. It is in the sequence featuring Joan Chen—the grand dame among the cast, and the first major star to appear in a Jia film—that this device gets most tested. Halfway through 24 City, when Chen delivers her monologue as a middle-aged factory worker who has missed her chance at love, the star’s glamorous face throws a wrench into the film’s chain of forthright testimonials. In a moment of startling reflexivity, the character recalls being so beautiful in her youth that her classmates compared her to Joan Chen, nicknaming her after the actress’ breakthrough performance in 1979’s Little Flower. Later, a clip of the film is shown playing on television as the woman prepares for another lonely dinner at home. The sequence’s depiction of the complex relationships that can exist between stars and their audiences is clever and poignant, but Chen’s presence causes discomfort for us rather than escape. Highlighting the unreliability of nonfiction filmmaking, Jia encourages us to question the ethics and the usefulness of seamlessly integrating famous actors with actual documentary subjects, people who have a real stake in the narrative and have paid the price for their social position. Is this just another one of Jia’s attempts at winking irony, like his heavy-handed use of the global simulacra in The World? Is it an act of vanity that Chen allows herself to become the film’s shorthand for Chinese feminine beauty, or poetic justice that the faceless, voiceless woman she portrays is now embodied by her idol? Does Jia mean to suggest that, as a Chinese woman, the privileged and highly educated Chen is automatically connected to or implicated in the lives of other Chinese women, including those of the working class? 24 City provokes such questions but resolves few of them, and ultimately the film would be a failure if its mixture of realism and movie-star intertext amounted to nothing more than a brain-tease, or yet another clichéd caution against the unreliability of documentaries. It is difficult to know exactly what Jia intends to prove by breaking these boundaries, but what raises his gimmick above superficiality is the heady sense of playfulness it manages to create without dishonoring the film’s often painful subject matter. Whether intended or not, Jia’s career-long challenging of the conventional fiction/nonfiction binary has the ethical result of counteracting his powerful position as the leading voice among China’s Sixth Generation filmmakers, and limits the ability of his oeuvre to pass off as a definitive statement on the soul of the nation. With each new film, it seems that Jia becomes more willing to assert his hard-earned authority as an artist in order to undermine his perceived authority as his country’s spokesman. In 24 City, the appearance of familiar faces and obviously staged sequences (including some casual sing-along numbers) lends documentary realism a sense of the uncanny, the otherworldly, as if the film were located on the bridge at which reality becomes a story ready for telling. It may be perverse of Jia to play games with genre while recording such intimate personal histories, but in a film that commits so much screen time to recollections of the past, his fusion of the real and the artificial reminds us that memory itself is guilty of the same manipulations.